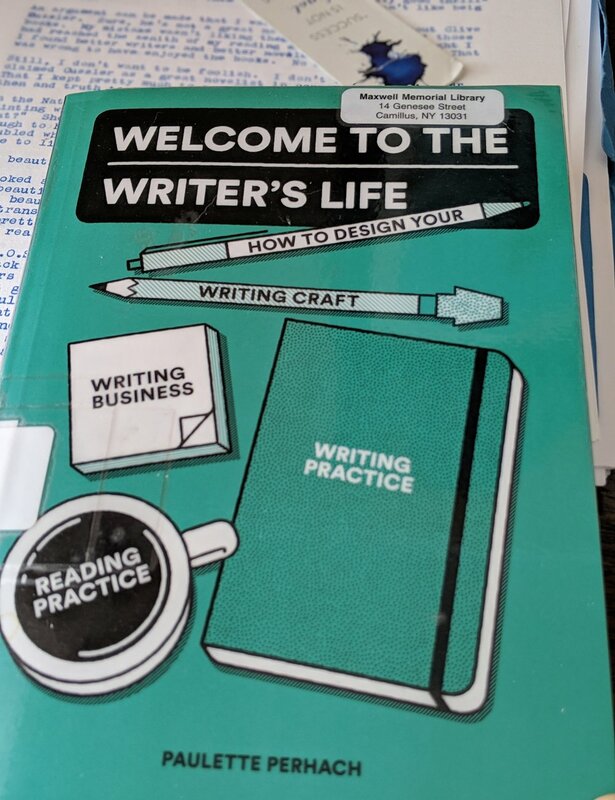 "Why You Should Be A Writer"
I'll have more to say about this book as I read the rest of it, but for now I want to share this section which gave me hope and might give some to you as well. I wish I wrote this, but I also found that in typing it I would have said it differently and I like that feeling. It's almost as if I know what I'm doing. You should buy this book. People who are not writers will happily provide you a million reasons why you should also not be a writer. Here's why, in my humble opinion, you should be a writer. Because writing is art, and practicing an art enriches your life. You know that feeling after writing, that inner contented sigh, as if you just got out of the hot tub? It's real. Studies have shown that writing expressively puts you in a better mood, lowers your stress, and improves depressive symptoms. Art bedazzles the dark soul and makes life shinier. You love words. If you love to write, good news: writers get to write all the time. If you love to read, great news: sitting on the couch, reading a book, now counts as work. Being a writer means you get to fill your life with words. A community of writers awaits. One day you will find yourself in a room full of people who are either writers or enthusiastic readers. The first time I went to a writer's conference, it felt like a home I never knew I had. You won't have to go this road alone, not entirely. Writing is a valuable skill. OK, so maybe if you've shopped around your sonnets, you realize not all forms of writing have a high dollar value on the market. However, the better you get at creative writing, the more you'll build up the marketable skill called "communications." The business magazine Fast Company even published an article called "Why Good Writing Is Essential For Business." You, the worker, with the succinct emails, typo-free presentations, and engaging content (puke), will be a more valuable asset to companies, if and when you need to be. Your creative work will get better. If you read a lot and write a lot, the writing you produce will improve. It might take longer than you want it to, but practice does make progress. Sometimes I find old writing and think, Oh no, did I write this? Why did I ever think this was good? Why did I email it to a dozen of my friends? But being embarrassed of my old work just means I'm better now than I was then. The bad work makes the better work possible. People will thank you for it. This part is weird. When I started out, I thought maybe one day someone would take pity on me and do me the favor of reading my writing. I didn't anticipate the feeling of someone thanking me for doing the thing I love doing anyway. One day, you might realize that everything you learned, all the work you did, and all the words you wrote led to this — someone who feels grateful your work exists, because it gave them something. Soulgasms. You'll figure the money out. You just will. Thousands of writers before you have. You will write in your free time, while the average American finds five hours a day to watch TV. Maybe one day you'll make money at it, or maybe you won't. You can plan for both scenarios and still be a prolific writer. To start working toward being a writer, you don't have to quit your day job. In fact, please do not. I don't have a spare bedroom. It's a good life. The most common regret people have at the end of their lives, according to hospice nurse Bronnie Ware, is that they didn't live lives true to themselves and what they wanted but instead lived the lives other people wanted for them. Nobody thinks they'll be that person with those regrets at the end of life, but Ware saw it over and over. Do what you really want to do, and go for it as a writer. Even before I was making any money or anyone cared that I was writing, my writing life made me happy: those times I thought of a word that made me snort, those readings where I made a crowd inhale in unison, the books that compelled me to read a line out loud to the nearest person, known to me or not. Of course, it has its frustrations, like any lifestyle. I still have problems, but they're writer problems.